The Response-to-Intervention (RTI) approach, tracks a student's progress and response to a given intervention (or series of interventions) that are designed to improve academic, social, behavioral, or emotional needs progress. RTI models have been closely scrutinized, researched, and reported in the past few years, and they are increasingly looked to as the foundation of future (and more and more as the present) of school psychology practice in schools. What is still lacking in the midst of a recent slew of handbooks, research studies, revised assessment scales and tests, and best-practices suggestions is a truly practical guidebook for actually implementing an RTI model. This book will fill this need. 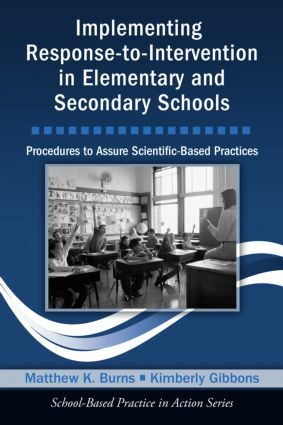 Following the structure and plan for our School-Based Practice in Action Series, authors Matt Burns and Kim Gibbons present a clear and concise guide for implementing a school-wide RTI model, from assessment and decision-making to Tiers I, II, and III interventions. As with other volumes in the series, a companion CD will include a wealth of examples of forms, checklists, reports, and progress monitoring materials for the practitioner.